Confession: I’ve been eating this White Chicken Chili recipe pretty consistently for over a year, but it’s just getting on the blog now because it’s SO good I’ve eaten it all before I could take a good picture. I changed up my strategy and ate a bowl first, this time, and then started photographing. You can thank me later, once you’ve made your own bowl of this creamy, zesty soup. It’s really starting to get into fall weather here in Boston and I just made a big pot of this chili to enjoy with some cornbread last week. I ate leftovers for days and definitely wasn’t mad about it. I throw everything in my Instant Pot in the morning and set it to cook while I’m at work, and come home to only 10 more minutes of prep before dinner is ready. Nothing beats a huge pot of chili being a few minutes away from ready when you come home from a long day. I use the slow cooker function on my Instant Pot, you can use a regular slow cooker, or I’m sure cook for longer on the traditional stovetop (try it and tell me how it goes!). 1 cup milk, half & half, or cream - This is flexible, I just pick based on what other meal’s I’m making that week! 1. Add 1 lb chicken breasts, 1 diced medium yellow onion, 3 cloves minced garlic, 3 cups chicken broth, can of drained corn, can of drained Great Northern Beans, 2 tsp salt, 1/2 tsp black pepper, 1 tbsp cumin, 1 tsp oregano, and 2 tsp chili powder to your slow cooker or Instant Pot. Cook 5 hours on Slow Cooker setting on *low* heat. 2. Once your chicken is fully cooked, after about 5 hours on low, shred the chicken breasts in the pot using two forks and add 1/2 cup diced cubes of cream cheese and 1 cup milk, half & half, or cream to the slow cooker. Whisk to incorporate, continuing to cook on low for about 10 more minutes. Taste and add more spices and/or salt & pepper to taste. 3. Once the chili has become creamy and thickened, add toppings: cilantro, sliced avocado, dollop of sour cream, shredded Mexican cheese, and/or sliced jalapenos and enjoy! STORING - Store in the fridge for up to 5 days in an airtight container. LUNCH TOMORROW - As I’ve said, this is a great recipe to make a big batch of in your slow cooker and have leftovers on hand - especially for a cozy lunch at work on a cold fall day! Make sure your containers are leak-proof. EXTRA INGREDIENTS - Use up the rest of your cream cheese in my favorite Instant Pot Mashed Potatoes or Tortellini Soup with Spinach and Mushroom. Have a cilantro-themed week with a few of my favorite cilantro recipes: Grilled Mexican Street Corn Soup, Crispy Chicken Lettuce Wraps with Peanut Sauce, or my Coconut Lime Shrimp. This recipe was inspired by and adapted from The Chunky Chef’s Creamy Crockpot White Chicken Chili. I'm super excited to share this Grilled Mexican Street Corn Soup recipe! It's a fun take on the classic Mexican street food, elotes. I love ordering this dish as one of the many delicious tapas at Toro, a great Boston restaurant that first introduced us to the wonders of Spanish tapas before our trip to Barcelona (no Mexican street food in Barca, though). While I definitely envision corn on the cob as the ultimate summer food, May counts as basically summer, right? This soup doesn't get too far ahead of itself, though, and will still keep you cozy on these still-chilly spring nights. Elotes features a creamy coating on fire roasted corn, finished with bright flavors like chile powder, cotija cheese, and lime juice. There are so many layers of flavor when you take your first (very messy) bite that I wondered how I could ever re-create that in soup form. I'd been inspired seeing different elotes soup recipes on the internet, but the flavors just weren't the same when I tried to make it the first few times. UNTIL NOW. It's all thanks to a few secret ingredients...courtesy of one of my favorite places on this planet, Trader Joe's. This soup wouldn't be the same without that charred, deep roasted corn flavor that comes from a fiery grilling. 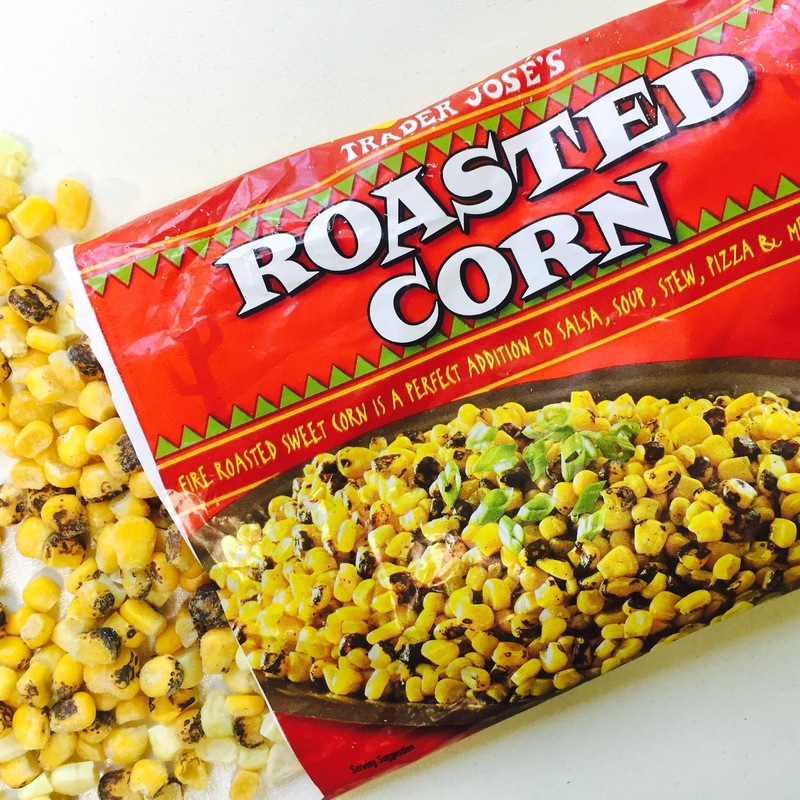 Thankfully, Trader Joe's freezer section has got you covered on this one: you'll need one bag of Trader Joe's Mexican Style Roasted Corn with Cotija Cheese and one bag of Trader Joe's Roasted Corn. Both bags have roasted corn, which will add that depth of flavor. I like the Mexican Style because there is some creamy sauce included in the bag, which acts as a nice base for the soup by adding that extra burst of flavor for you to build onto. I went with a more "plain" second bag because my recipe adds my own seasonings and flavorings, but this is really flexible - Note: If you can only find one of these kinds of corn at TJ's, it is not a huge deal at all - just make sure you have two bags of corn total. You can also make this with regular frozen corn as well as canned corn - while the roasted flavor won't be as intense, the bright, flavorful toppings like the cotija cheese and lime juice will still guarantee this dish is a hit. Other recipes with these ingredients: Cilantro: all my recipes here, including my Chicken Enchiladas Recipe // Sour Cream: add it atop Turkey Chili or my Five Minute Fish Taco Bowls. 1. Heat olive oil in a soup pot over medium head. Add 1 small yellow onion, diced, to the pot and stir 2-3 minutes, until transluscent. 2. Add the two bags of corn and stir for 3-4 minutes, until starting to defrost. IMPORTANT: Set aside 1 cup of the corn mixture, for topping the soup later. 3. Add 4 cups vegetable broth and 1/2 cup sour cream to the soup and let simmer for 10 minutes. 4. Slowly and carefully, in batches if needed, transfer the majority of the soup into a blender and blend until desired texture. 5. Transfer back into your soup pot and add salt, pepper, and chili powder to taste. Let simmer on medium-low heat while you finish preparing the topping. 6. Meanwhile, while the soup is simmering, chop about 1/4 cup cilantro and toss it with the corn mixture that you said aside earlier in step 2. 7. 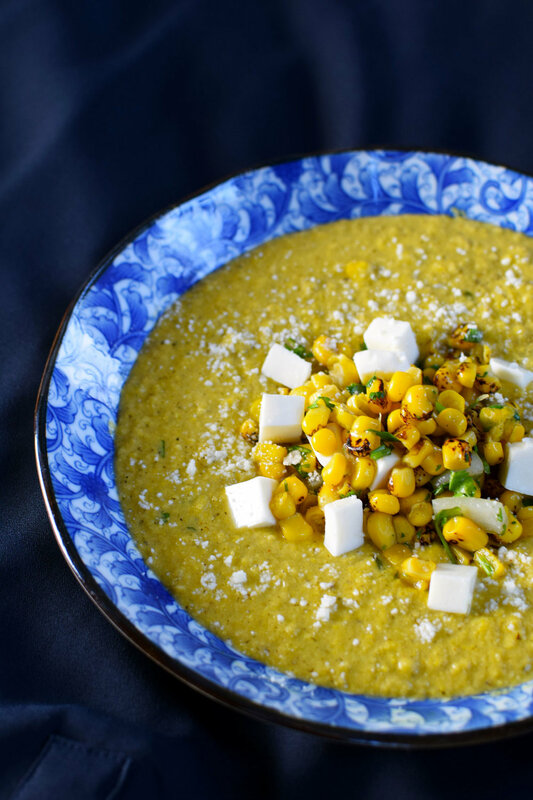 Plate the soup and top with the corn and cilantro mixture, cotjia cheese and a squeeze of the lime wedges and enjoy! STORING - Store in the fridge for up to 5 days in an airtight container. I love making a big batch of soup and keeping it in the fridge for a quick meal. I wouldn't recommend freezing this due to the added dairy (sour cream) but if you leave that out it would be very freezer friendly - just top with cheese once defrosted! LUNCH TOMORROW - Keep the toppings separate and add once you've heated up your soup. It will help it tasting just as fresh as the night you made it! Especially the lime - squeezing a fresh lime wedge over the top while sitting at your desk will make those desk lunches slightly less sad. EXTRA INGREDIENTS - You'll likely have extra cilantro, which is also a favorite garnish in my Easy Chicken Enchiladas recipe. Check out all my cilantro recipes here by scrolling down the page). Use any extra sour cream atop a cozy bowl of Turkey Chili with some of that cilantro as well. One of my favorite winter comfort foods is chili. It's so great to cozy up with a bowl of steaming chili topped with cheese, sour cream, and of course, with a buttery, crumbling corn muffin. 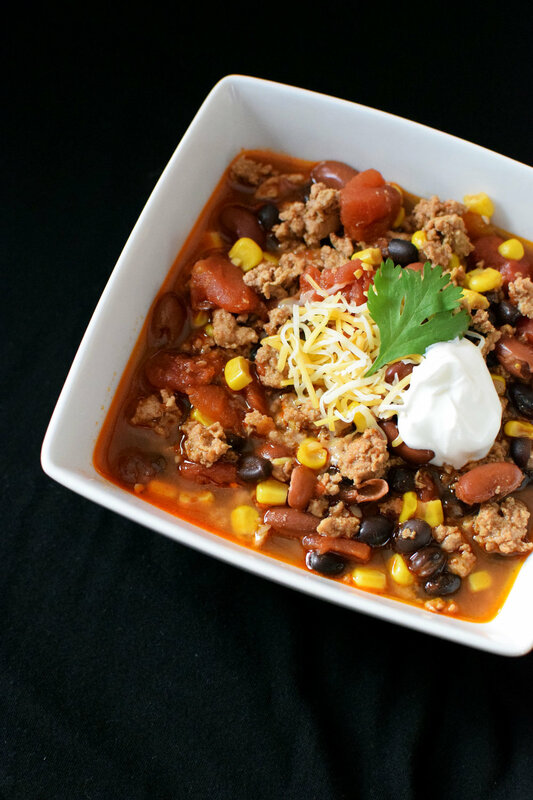 I've perfected this Instant Pot Turkey Chili recipe that is super simple to make (p.s. even if you don't have an Instant Pot - which you totally should - I've included slow cooker and stove top directions, too). Chili is super simple to make, so if you're looking for an easy first-time recipe, go for this one. It is also very flexible - you can adjust the types of beans, the amount of spice, add additional vegetables, change up the toppings, etc. As long as you've got some ground turkey (or beef, if you want! ), beans, veggies, spices, and broth, you're basically good. It's easy to double the recipe and make a large batch for a crowd or to have leftovers either for lunches for the week or to keep in your freezer when you need a quick weeknight meal. Either way, you now have an easy go-to recipe for winter comfort food on a cold night! Dairy-free: Skip the cheese on top or choose a dairy free cheese. Vegetarian Friendly: Use vegetable broth and substitute the ground turkey for an extra can of beans - I like to add pinto beans sometimes, but you can also add an extra can of black or kidney depending on your preferences. 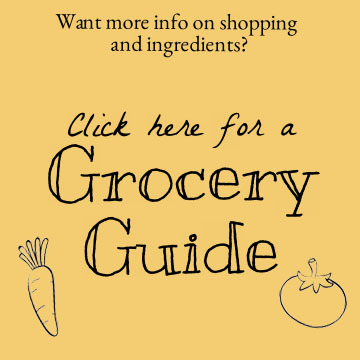 Vegan-Friendly Follow dairy-free and vegetarian recommendations. 1. Turn on the Instant Pot "sauté" setting, normal heat. Add 1 pound ground turkey to the Instant Pot along with 1 full taco spice seasoning packet. Sauté the ground turkey until it is completely brown fully cooked. If you're making this without an Instant Pot, just brown the ground turkey on the stove and add it to your slow cooker or, for stove top, a large soup pot. 2. Drain 1 can black beans, 1 can kidney beans, and 1 can corn in a strainer. Add to the Instant Pot. 3. Add 1 can diced tomatoes to the Instant Pot along with 2 cups vegetable or chicken broth. 4. Stir in 2 teaspoons cumin, 2 teaspoons chili powder, 2 teaspoons paprika, and 1 teaspoon cinnamon. Add salt & pepper to taste. 5. Once everything is in the pot, close the lid and turn the Instant Pot on Manual for 10 minutes (high pressure). When the timer is done, let the pot NPR (natural pressure release - basically, just don't touch it) for 5 minutes. After 5 minutes, slowly release the seal valve until the pressure pin drops, and open up the pot! If you're making this in a slow cooker: Cook on low 3 hours. If you're making this on the stove top: Cook at a low simmer for 30 minutes. 6. Stir and taste the chili. Add salt & pepper as needed. 7. Serve topped with cheese, sour cream, cilantro, and whatever else you like! I love mine with cornbread muffins on the side, too. Enjoy! STORING - Store in the fridge for up to 5 days in an airtight container. This is one of my favorite big batch recipes to freeze because it tastes just as good defrosted during a busy week! I often make a double batch just to keep some leftovers in the freezer. Pull my favorite trick, "soup in a bag" and load up freezer-friendly ziplock bags with chili. Freeze them laying down flat and then stand them stacked up in your fridge to grab whenever you need a quick meal. LUNCH TOMORROW - This has been my meal prep lunch recipe for the week at school so many times. It seems to get tastier after the first day anyway, and I love packing corn muffins on the side to enjoy with it. Make sure to store any sour cream in a separate container so you don't end up heating that up as well. EXTRA INGREDIENTS - This recipe does a pretty good job of using up almost everything in it! You'll use all the turkey and add ins. If you have to buy the spices they'll last forever in your spice cabinet. If you end up having extra broth, try using it up in my recipes for Butternut Squash & Apple Soup or Instant Pot Risotto. The best part about living in New England might be the fall, and therefore, the opportunity to make homemade soups with farm fresh harvest ingredients, like this Butternut Squash & Apple Soup recipe. Not only is this hearty vegetarian soup a delicious way to celebrate the season, it's also shockingly easy to make. I spent about 15 minutes total actually making the soup, and my Instant Pot did all the rest. This recipe is the ideal pressure cooker or slow cooker recipe for a cool fall day. If you can chop and press a button or two, you can make this soup. It's full of butternut squash, apples, potatoes, and onions that simmer down into a delicious soup in your slow cooker or pressure cooker while you're out enjoying the cooler weather. One of my favorite parts about this soup is that it freezes so well - I made a double batch and now I know I have some last minute dinners or lunches on hand for when things get busy this October. Speaking of busy, that word has defined my past few months. After a non-stop summer, I transitioned into a amazing but crazy new job as a high school history teacher and also moved apartments. While we kept eating good food (most of the time), I struggled to find the time to post about it. I usually found time to snap a picture before digging in, so I'm looking forward to sharing some new recipes with you this season. As I settle into a rhythm of things after some big changes, I look forward to posting more regularly and hopefully sitting down to get that Rome travel guide done. Even though I've been getting my life in order, it's been so exciting to see the blog really take off over the summer. I love hearing from new readers - who aren't my mom! - when they've made a recipe. I am also honored to have earned some recognition from Feedspot as one of the Top 100 Millennial Blogs - coming in at #50. Thank you! As I start my new job and get settled in my new apartment, I'm excited for new beginnings and milestones with not just my life, but also this blog. Please continue to share with me when you make my recipes - it makes me so happy - and continue to reach out about travel recommendations, questions about cooking and grocery shopping, and more. And stay tuned for more recipes coming at you soon! Total Time: Depends on cooking method - but minimal "hands on" time! Dairy-free & Vegan: Substitute dairy-free milk (coconut milk would be good) or omit the milk. 1. Dice the butternut squash, apples, onion, potato, and carrots. 2. Add the vegetables to your pot (whether Instant Pot or slow cooker) with 4 cloves minced garlic, a pinch of salt and pepper, a pinch of cinnamon, and 2 cups vegetable broth. 3. Turn the Instant Pot on high pressure for 30 minutes, or turn your slow cooker on low for 7-8 hours or high for 5-6 hours. Walk away! 4. Once the soup is done cooking, you need to puree it. The best way to do this is with a blender. I hate immersion blenders, or I'm just really bad at using them, it's unclear, so I pour my soup into my beloved Vitamix and be really, really careful not to burn myself. Do the soup in two batches, pouring the pureed soup into a new pot (because you can't mix it with the un-pureed soup, obviously) and starting over adding new soup to the blender. This sounds complicated but I promise it's not. It's just pouring liquid back and forth. You can do it! 5. Once the soup is pureed, stir about a cup of milk into the soup. You might need to heat the new pot up on the stove for a bit if the milk brings down the temperature, but my soup was so hot that the milk brought it to a perfect serving temp. 6. Add any additional salt & pepper to taste. Serve with fresh bread and enjoy! STORING - Store in the fridge for up to 5 days, or a few months in the freezer. I LOVE popping single-serving bags of soup into the freezer (freeze them flat first for quicker thawing later, then stand them up to save space once they're frozen). I store my soups in freezer quart bags and label them clearly with a Sharpie before freezing. Enjoying "soup in a bag" (that has since been defrosted) is now a culinary delight in our apartment. LUNCH TOMORROW - There's nothing like a hearty bowl of soup to warm up your day at work. Pack with a slice of crusty bread to scoop up the last spoonful. EXTRA INGREDIENTS - Since this soup freezes so well, I would just use your ingredients to make an extra-big batch and keep portions in the freezer for quick weeknight meals or last minute lunches. If you do have extra ingredients, like butternut squash, the sauce from my Butternut Squash and Sage Tortellini recipe is delicious on any and all types of pasta. Potatoes, carrots, and onions are extremely versatile ingredients and they're a great base for my favorite hearty Chicken Pot Pie recipe. It's getting chillier and chillier here in Boston, and that means it's the perfect time for my Tortellini Soup with Spinach & Mushrooms recipe. The secret ingredient in this recipe is cream cheese. Call me crazy, but it adds a tangy depth of flavor and creaminess in a short amount of time - you'll love it. You need only 6 simple ingredients for this recipe: tortellini, tomato sauce, chicken broth, cream cheese, spinach, and mushrooms. This recipe is perfect for making a big batch at the beginning of the week and enjoying throughout. You can even think about mixing it up with different kinds of tortellini - a porcini mushroom tortellini would complement the mushrooms in the broth, or even a pesto tortellini for an added punch of flavor! Vegan-Friendly: Follow the dairy free options and use vegetable broth! 1. Boil water for tortellini and cook your one package of tortellini. 2. Meanwhile, heat up 1 large can of tomato sauce and 1 cup of chicken or vegetable broth in a pot. Add 1 - 8oz. package of cream cheese, stirring constantly until it melts in. You can add more chicken or vegetable broth if you'd like a thinner broth. 3. Once the cream cheese has melted, let the broth cool a bit and blend the broth in a blender to smooth it out. 4. Now you need to add your one package of sliced white mushrooms. There are two ways to do this: 1) Just add them right in! 4. Right at the end, stir in the bag of spinach and let it wilt. Then, spoon into bowls and enjoy! LUNCH TOMORROW - This soup almost tastes better the next day, once everything has soaked in! STORING - Store for 3-5 days in an airtight container in the fridge. EXTRA INGREDIENTS - Try out my recipe for Butternut Squash & Sage Tortellini with any extra tortellini you have on hand. Make a healthy salad for lunch with extra spinach. Extra tomato sauce can be frozen for almost any recipe in the future - just freeze it in a freezer safe ziplock bag! If you have extra cream cheese, this pepper relish dip is a childhood favorite of mine!